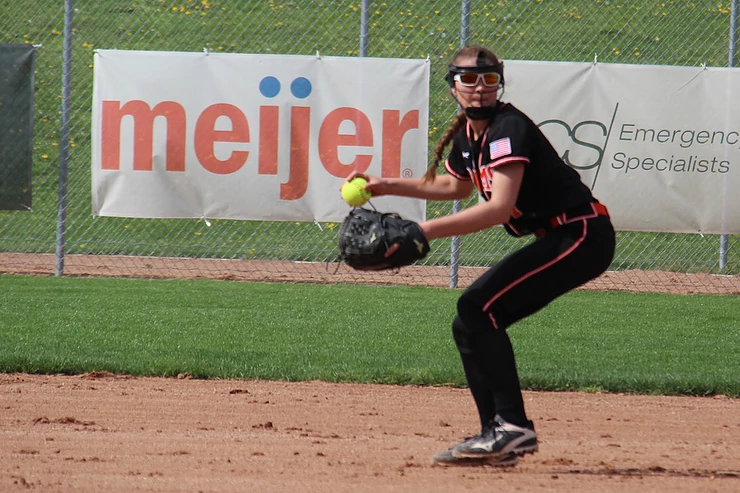 The Rams played host on the diamond to West Ottawa and came away with two wins in a doubleheader played Tuesday, May 22. The Rams nosed out the Panthers 2-1 in the first game and then dominated in an 11-0 mercy-shortened victory. The Panthers earned the 1-0 lead in the second inning and held on until the Rams tied it in the top of the sixth. Rockford pushed a run over in the top of the seventh to claim the OK Red victory. Rockford had three hits in the first game and committed only one error in the field. The Rams were paced by Lauren Lanphear, Lily Guerra, and Kylie Winkels, who each tallied a hit for the Rams. Winkels’ was a double, and Lanphear collected an RBI. Rachel Foster got the win in the circle for Rockford, giving up only two hits for the game. It only took the Rams five innings to claim the second victory. Rockford tallied 10 hits at the plate, showing their firepower by registering two doubles, three triples and a home run for the game. Rockford’s Chloe Bowen hit a home run, and tallied three RBI for the game. Lily Guerra, Kylie Winkels, Jenna Davis, and Chloe Bowen collected two hits apiece for the Rams. Davis recorded two doubles to help her cause in the circle.Guerra, Lanphear, and Winkels each had a triple for Rockford. Davis earned the win in the circle, giving up only three hits for the game.